The developmental perspective is becoming increasingly significant in criminology and in research on antisocial and criminal behavior. Developmental criminology can explain the stability of antisocial behavior as well as how it emerges and disappears across the life span. This volume brings together many of the most renowned scientists in the field. They report the latest findings, explain various phenomena and trajectories of antisocial behavior, and present new research methods. 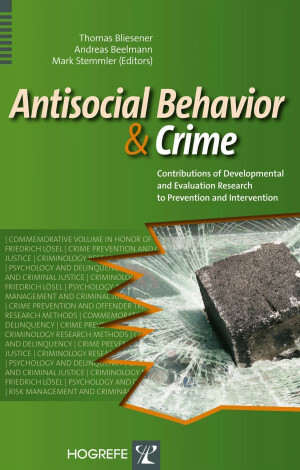 In a series of reviews, they analyze the significance of biological, psychological, and social risk factors in the development of antisocial behavior and show how these findings can be applied not only in crime prevention, criminal justice, and offender treatment, but also in the risk management of young offenders. "A contemporary text on the development, prevention, treatment, and management of antisocial behaviours, [...] authored by leading researchers within the area. [...] a well researched contribution to the field of antisocial behaviour and crime. It provides the reader with an up-to-date knowledge of the latest findings [...] I warmly recommend this text." "This is a well researched and comprehensive text, [...] that will prove invaluable to academics, students and practitioners who are trying to develop an up-to-date understanding of this very complex topic. It will also be of assistance to practitioners in the field who are trying to manage the complexities of delinquency and aggression in challenging circumstances." "This book covers important topics in juvenile justice, [...] It is research-based, with findings that are helpful for both treatment and risk management. Society is frustrated with crime rates on an international level. This book provides some answers and should be in the libraries of clinicians, researchers, and policy makers."